I upgraded the lens on my Gopro camera and the video quality REALLY got improved. The new lens was a Sunex DSL355A-650-F2.8. The reason I did this is because the original Gopro lens has way too much distortion and fisheye effect. The Gopro camera before and after changing lens to Sunex DSL335A-650-F2.8. Hello, did you attached the lens after put the cover back? Did you use loctite or any other glue? I didn’t use any loctite, it stays in place pretty well anyway. My next modification will be to cut off the front cover “rim” around the lens so I can change back to the original lens more easily. Is the housing still fit over the camera with that lens sticking out like that? The lens is a bit too long for the housing, so when if I would need the housing for a shoot, I change back to the original lens. Since I use the live video output, I didn’t use the housing even before I changed the lens. Fantastic little video. Thanks for the help, will definitely be visiting back here to see some aerial footage of the camera in action. Hello, a couple things. How hot did you have to get the loctite before it released? Have you had the sunex lens apart before and do you know the order in which it goes back together? I bought a gopro with a sunex installed and i cant get the lens out so i unscrewed the top off the sunex lens which allows it to fit through the case – but i turned the assembly upside down and all the components fell out – i have no idea what order it goes back together in. Just a quick question, have you thought possible to cut the new lens to the same length as the original lens? Also is there any other lens that may fit this camera? Thanks in advance and great job making this informational!!! Hello, do these lenses work also with the go Pro 1 Motorsports Wide? It will probably work with that camera too, but I haven’t tried it. Keep in mind that the new lens is a bit longer than the original lens, so it won’t fit in the protective housing if you don’t remove the front lens from the housing. It’s really not a problem for aerial photography, but it might be a problem when it comes to other applications. hello,did this lens will fits the new gopro 2 camera ? I haven’t tried it on gopro 2, so I’m not shure if it works. 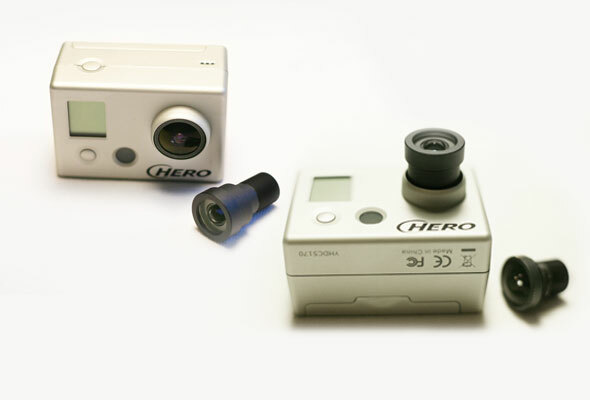 Hello, I am interested in buying the lens for my GoPro Hero 1. I am in Italy, and the shipping price? Great video! Thanks. I would like to add that my lens needed to be adjusted for focus. I simply hooked my GoPro up to my pc monitor using the supplied cables and “live feed out” setting on the GoPro. Then loosened or tightened the lens while watching the picture on my monitor for the correct focus. Do you know where I can get a replacement lens for the Gopro that is exactly like the one that comes with the camera? Sunex says on their website, that the lense doesn´t fit into the GoPro2. Does anybody know an other solution or a fitting lense to get away from these fisheye effects? One short question about the focus. If I understand that thread right you remove the original lens and replace it with another lens, but you only stick the new lens somehow in the lens shaft. Now my question, what’s about the flange focal distance how do you fix that to get a sharp image result? Thanks to much for this replacement inspiration.